I've been working on some new designs for a Summer school class I've been asked to teach. This is the first. I've got a cushion to make this afternoon during kindy hours. Lots of fun! Do you like it? Is it the sort of thing you'd like to learn how to make? It might cost you a bit to fly over here and attend the summer school Sarah :oP Great to hear you like it though! congrats on the new teaching gig - that bag is gorgeous! gorgeous bag Sarah! Sorry we couldn't meet up while you were over but at least we can check in on creative space day! Love it! Looks nice and roomy too. Yes I'd love to learn to make something like this :) Can you tell us more about summer school? I always love a BIG bag and the bird is beautiful!! Love the colours you 've chosen! I'm a sucker for NZ birds - love your interpretation of the Tui. Bags are always popular classes in my neck of the woods. I'm sure you'll do well. Love the bag! Can't wait to see the cushion too! Love it!!! ...and yeah I'd like to know how to make it. Looks great, love the bird! I would love to learn how to make that, I totally love that bird. That looks like a great bag project, a little more complicated than just a tote bag and including a cute little applique. I like it very much. Have fun with the teaching! I would love to learn how to make this. Lovely, indeed! 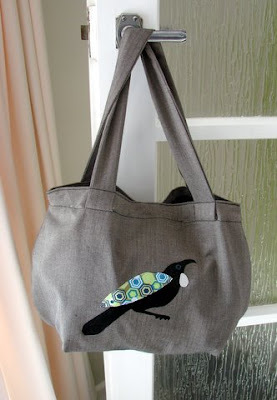 Lovely bag and the bird really makes it - bags are a common theme around blogland at the moment! Would love to learn how to make that bag ( my grandmother loved the Tui)... BUT ... you will need to fly to Australia first.